With extensive maritime zones in the Indian Ocean, Australia and India’s strategic interests continue to converge. Next week, and running until mid-April, Australia and India will conduct the latest iteration of their bilateral naval exercise AUSINDEX. The exercise, in its third installment, will be conducted in the Bay of Bengal and focus on anti-submarine warfare. It will be Australia’s largest defense force deployment for an exercise in Indian waters, with over 1,000 Australian personnel taking part, comprising naval, army, and air force assets. The AUSINDEX exercise is a prominent display of the increased defense collaboration between the two countries, continuing to implement and enhance the Framework for Security Cooperation developed by Canberra and New Delhi in 2014. As countries with extensive maritime zones in the Indian Ocean there is an increasing recognition of Australia and India’s converging strategic interests. Speaking at the Raisina Dialogue in Delhi in January, Australian Foreign Minister Marise Payne made note of this reality, stating, “Our respective futures are intertwined and heavily dependent on how well we cooperate on the challenges and opportunities in the Indian Ocean in the decades ahead.” These shared interests included the importance of freedom of navigation and unobstructed lawful commerce, as well as the resolution of maritime disputes by diplomatic means, in accordance with the United Nations Convention on the Law of the Sea (UNCLOS). There is also an increased recognition of the Indian Ocean as a contested geostrategic space. The ocean is vital to the growing energy needs of most countries in the Indo-Pacific region, and China in particular is demonstrating its increased capabilities to protect its interests across the Indian Ocean, as well as influence states in the South Asian littoral. That the forthcoming iteration of AUSINDEX will be focused on submarine tracking and engagement seems to be in response to the emergence of Chinese submarines on long-range deployments in the Indian Ocean. This activity remains a concern for New Delhi, which sees itself as the rightful resident power in the Indian Ocean and is wary of China’s ambitions. It is likely that India would see Australia as a compatible partner in its attempts to defend this space, and its idealized place within it. However, despite Payne’s acknowledgment of the challenges and opportunities for Australia in the Indian Ocean, Canberra continues to view the Indian Ocean as its second sea, and envisions itself far more as a Pacific Ocean state. This is an obvious reflection of its population being concentrated on its eastern coastline, and its largest trading partners being in Northeast Asia and across the Pacific to the United States. Yet in order to broaden the country’s reach, and in particular enhance the relationship with India, the Indian Ocean will require greater attention. Some progress has been made in this regard. Despite India’s aversion to formal alliances, in 2009 the two countries elevated their relationship to a “strategic partnership,” and Australia’s 2017 foreign policy white paper recognized India as a country of “first order” importance. And in October last year the two countries held their second two-plus-two Foreign and Defense Secretaries’ Dialogue. Alongside this, the term “Indo-Pacific” has been enthusiastically adopted by Australia’s Department of Foreign Affairs and Trade (DFAT) as an indication of Australia’s aspirations as a dual ocean power, and a signal of its intent toward India. While Australia’s Indian Ocean capabilities remain limited, these capabilities multiply significantly in partnership. That’s true both in a bilateral manner, as will be on display with the AUSINDEX exercise, or within a multilateral framework should the tentative steps toward the Quadrilateral Security Dialogue — incorporating the United States and Japan alongside India and Australia — ever become strides. Despite much enthusiasm and speculation from analysts, the actualization of the Quad remains slightly above statis, with the most recent consultative meeting of officials taking place in last June in Singapore. Despite these discussions, Australia’s withdrawal from initial talks in 2007 is seen as a reason why New Delhi remains cool on the prospect, and why it continues to reject Australia’s desire to participate in the annual Malabar exercises alongside the United States and Japan. This may, however, actually be due to New Delhi’s wariness toward pushing China into too much of a defensive posture, with Beijing’s suspicions that the Quad — should it ever take on greater substance — would constituent a Chinese containment strategy. In the Nikkei Asian Review this week, former Australian Prime Minister Kevin Rudd laid out the reasoning for his decision to withdraw from the Quad 1.0 in light of his reading of the reluctant sentiments within the Japanese and Indian governments at the time, and the potential adverse entanglements it may create in regards to China. However, Rudd also notes that over a decade later the “strategic circumstances of our wider region have changed profoundly” and indicates Australia would now share Japanese enthusiasm toward a more formalized security architecture between the four states. 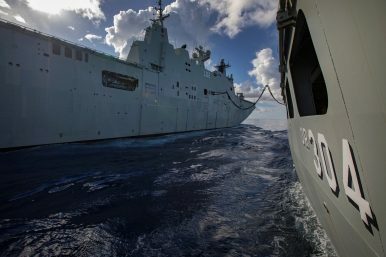 The scale of next week’s AUSINDEX exercise is an indication that the defense relationship between India and Australia is steadily being consolidated, and the strengthening of this bilateral architecture may in fact need to be an essential precursor to the further coordination and integration with the other two powers, should it ever come to fruition. If Australia is serious about enhanced engagement with India, then the education push should go both ways.